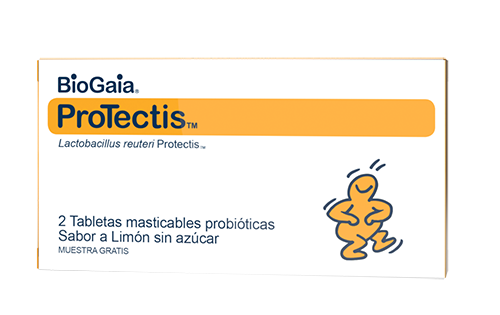 BioGaia Protectis tabs is a food supplement containing the patented lactic acid bacterium Lactobacillus reuteri Protectis (L. reuteri DSM 17938) that helps the good microorganisms restore a natural balance in the gut. Because L. reuteri Protectis naturally colonizes humans it has a strong adaptation to persist and interact with humans. L. reuteri Protectis has been tested in more than 130 clinical trials and proven effective and safe for children and adults. Storage: Store in a dry place, not above room temperature (max 25 °C/77 °F). Keep out of reach of children. Pregnancy and breast-feeding: The product can be used during pregnancy and breast-feeding. Bulking agent (isomalt), sweetener (xylitol), L. reuteri DSM 17938, palm oil, natural lemon flavoring and flavor enhancer (citric acid). One tablet consists of a minimum of 100 million live L. reuteri Protectis. Net weight per tablet, 450 mg. Excessive consumption may have a laxative effect due to the content of sweeteners in the product. 1–2 chewable tablets per day. Use regularly for good gut health or when temporary stomach dis comfort occurs. Recommended daily dose should not be exceeded. This product should not be used as a substitute for a varied diet. What is Lactobacillus reuteri Gastrus? Lactobacillus reuteri Gastrus is a combination of two probiotic strains, Lactobacillus reuteri DSM 17938 and Lactobacillus reuteri ATCC PTA 6475. L. reuteri Gastrus is used in BioGaia’s gut health products. Probiotics are good bacteria that can be found in dietary supplements and sometimes in dairy products. Probiotics are defined as ”live microorganisms that, when administered in adequate amounts, confer a health benefit on the host.” (WHO/FAO 2002, Hill C et al. 2014). An important criterium for qualifying as a true probiotic is that health benefits have been proven in clinical studies. Furthermore, a probiotic product must contain the same bacterial strain(s) and the same dose that was used in the clinical studies. Are BioGaia products free from common allergens? All BioGaia products are free from common allergens such as egg, peanuts, tree nuts, fish, shellfish and soy. Our products are sold by distribution partners in around 100 countries. Usually, they are sold through the major pharmacy chains. For information on where to buy our products, please contact our distribution partner in your country. Can I use BioGaia Protectis tablets if I am intolerant and/or allergic to gluten, lactose and/or milk protein? In BioGaia Protectis tablets neither milk protein nor lactose are detectable, and the gluten level is below EU limit value for gluten-free products. As food regulation varies from country to country, the product labelling may differ.